Lithium-ion batteries and metal hydrides are key technologies for storing green energy. Lithium-ion battery: Rechargeable lithium-ion batteries are used in mobile devices like cell phones and laptops. For applications in electric or hybrid vehicles the efficiency, capacity and safety must be improved considerably. To this end a detailed understanding of the involved chemical and physical phenomena is mandatory. During discharging of a lithium-ion battery, lithium atoms reversibly will be stored on interstitial lattice sites of the crystals of a many-particle electrode. During charging and discharging of a LiFePO4 battery the lithium atoms form a two phase system with a lithium-rich and a lithium-poor phase. 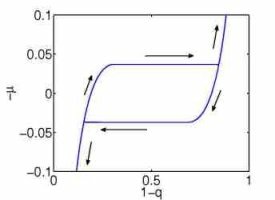 The objective is to find a suitable description of the underlying effects and to simulate the hysteresis in the capacity-voltage diagram. Scenario A: All FePO4 particles behave identical. This implies that the phase transition simultaneously occurs in all particles implying that the battery can be described by a single particle model, i.e. the Core-Shell-Model. Figure 2: Simulation of lithium storage within a single cathode particle (LiFePO4), Core-Shell-Model. Simulations show that a single particle model cannot correctly predict the correct capacity-voltage diagram for slow charging/discharging processes. Scenario B: The particles behave differently. The phase transition occurs within in the particle ensemble. On that principle a stochastic many-particle model and an equivalent Fokker-Planck-Model is developed. Both models correctly predict the voltage-capacity-diagrams for large and low charging/discharging times as well. Moreover the models allow the simulation of the phase transition within the ensemble for varying particle size distribution. Metal hydride: The application of fuel cells in automobiles relies on safe and effective hydrogen storage. Hydrogen can be stored as liquid or vapor in pressure vessels, on large surfaces of nanostructures or in metallic crystals. Concerning the volume density of hydrogen, hydrogen storage in metallic crystals is the most effective one. Figure 4: Visualization of hydrogen storage by magnesium particles. During the reversible storage of hydrogen in magnesia crystals a hydride phase will be formed. 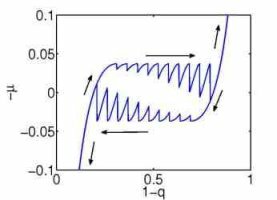 This process and its inversion is accompanied by phase transition and hysteresis. An active research goal is the modeling and simulation of the hydration and dehydration processes. Figure 4: Simulation of a loading/unloading process with a many particle model. Left: 10 storage particles. Right: 1000 storage particles. We consider a Fokker-Planck equation on a compact interval where, as a constraint, the first moment is a prescribed function of time. Eliminating the associated Lagrange multiplier one obtains nonlinear and nonlocal terms. After establishing suitable local existence results, we use the relative entropy as an energy functional. However, the time-dependent constraint leads to a source term such that a delicate analysis is needed to show that the dissipation terms are strong enough to control the work done by the constraint. We obtain global existence of solutions as long as the prescribed first moment stays in the interior of an interval. If the prescribed moment converges to a constant value inside the interior of the interval, then the solution stabilises to the unique steady state. W. Dreyer, C. Guhlke, R. Huth, The behavior of a many-particle cathode in a lithium-ion battery, Physica D. Nonlinear Phenomena, 240 (2011), pp. 1008--1019. W. Dreyer, M. Gaberšček, C. Guhlke, R. Huth, J. Jamnik, Phase transition and hysteresis in a rechargeable lithium battery, European Journal of Applied Mathematics, 22 (2011), pp. 267--290. W. Dreyer, C. Guhlke, M. Herrmann, Hysteresis and phase transition in many-particle storage systems, Continuum Mechanics and Thermodynamics, 23 (2011), pp. 211--231. We study the behavior of systems consisting of ensembles of interconnected storage particles. Our examples concern the storage of lithium in many-particle electrodes of rechargeable lithium-ion batteries and the storage of air in a system of interconnected rubber balloons. We are particularly interested in those storage systems whose constituents exhibit non-monotone material behavior leading to transitions between two coexisting phases and to hysteresis. In the current study we consider the case that the time to approach equilibrium of a single storage particle is much smaller than the time for full charging of the ensemble. In this regime the evolution of the probability to find a particle of the ensemble in a certain state, may be described by a nonlocal conservation law of Fokker-Planck type. Two constant parameter control whether the ensemble transits the 2-phase region along a Maxwell line or along a hysteresis path or if the ensemble shows the same non-monotone behavior as its constituents. C. Guhlke, Hysteresis due to non-monotone material behaviour inside many-particle systems, SIAM Conference on Mathematical Aspects of Materials Science (MS10), May 23 - 26, 2010, Philadelphia, USA, May 23, 2010. C. Guhlke, Hysteresis due to non-monotone material behaviour inside many-particle systems, DPG Spring Meeting 2010, March 21 - 26, 2010, Regensburg, March 25, 2010. W. Dreyer, Hysteresis and phase transition in many-particle storage systems, 13th International Conference on Hyperbolic Problems: Theory, Numerics, Applications (HYP 2010), June 14 - 19, 2010, Beijing, China, June 17, 2010.